Today, the charm of Airwheel Z5 standing up electric scooter will be discussed. Followed by Airwheel Z3, Airwheel Z5 was born with more intriguing features. Same as Airwheel Z3, Airwheel Z5 installs customized 8 inch tyres, which are designed to be bumpy-patterned for better grip. Airwheel Z5’s motor is carefully selected, in combination the N45 magnet steel and 270 silicon steel sheet, energy-saving and quieter. Stronger power gives you exciting gliding experience. Usually, the battery pack equipped on scooter is hard to disassemble, while we have made Airwheel Z5’s battery pack in a modular design. Modular battery design is designed to be built-out and replaceable. That is, riders can easily disassemble and replace the battery. It only takes a few seconds to finish it even if you have no operational ability. 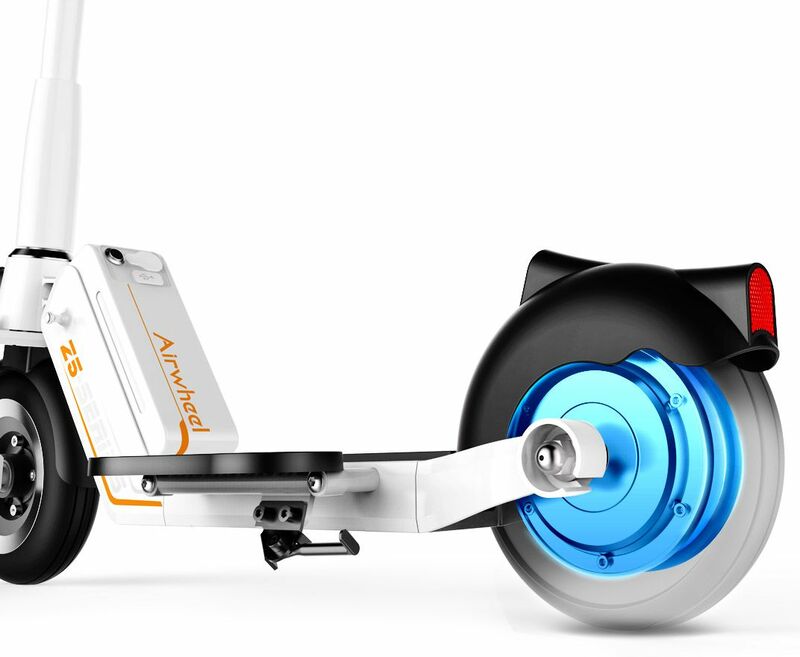 Specifically developed a mobile phone Airwheel APP that can be connected to Z5 foldable electric scooter for adults anytime to know the speed, residual power and mileage etc. With the App, riders can check the malfunction to simplify the process of maintenance. With the intelligent security tail lights system, it brings not only the attention, but also safety. Brake taillight gives warning to the rear vehicles and pedestrians. Multi-mode headlight lightens the dark environment. Dual shock mitigation systems are much more effective than single shock mitigation system. Dual shock mitigation systems can conquer various road conditions. The front tire is pneumatic tire, and the rear tire is solid tire. Ride smoothly and ride gracefully with Airwheel Z5 electric standing scooter. Foldable pedals alter the twisty riding stature. The obverse standing posture is more in line with the body's daily standing habit, and reduces the burden on both legs. Convex handle, combined with curved shape design operating rod provides enough room for the hands. Specially designed bayonet facilitates riders to carry around. Z5 fast electric scooter is easy to fold by lifting and pulling with the innovative foldable handle design. Multiple folding systems enable portability and convenience. Every time, the details are improved to provide you better and safer riding experience. Next：About Airwheel S9 service robot and brand new C series.